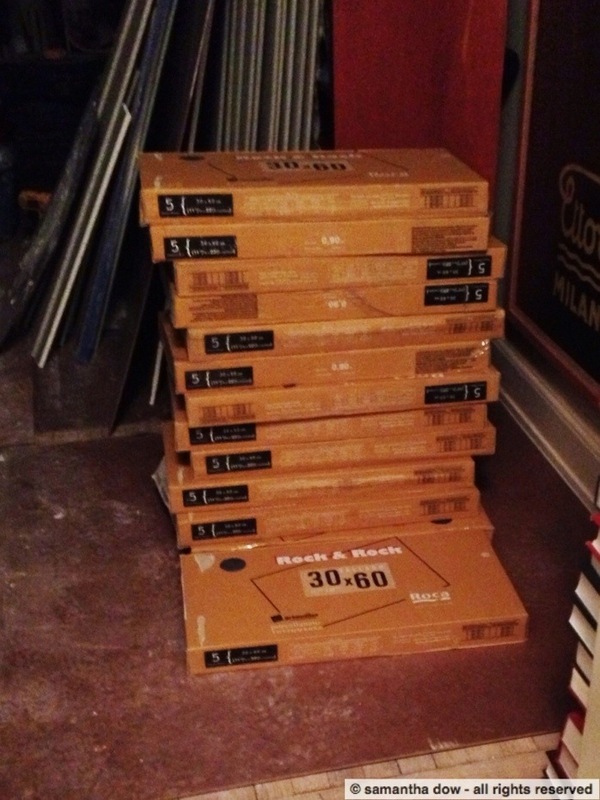 …and they’ve started actually installing the floor. No *actual* floor yet, but the subfloor is in, so that’s progress! 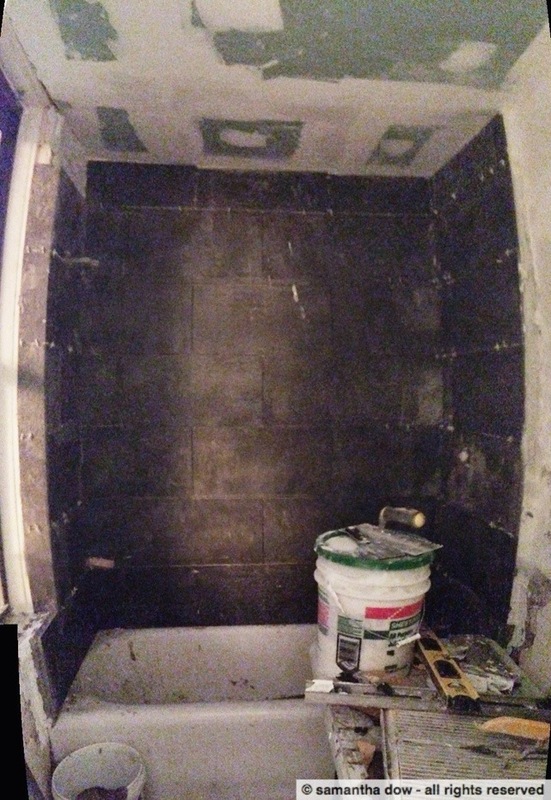 Plus, the walls are now fully grouted. 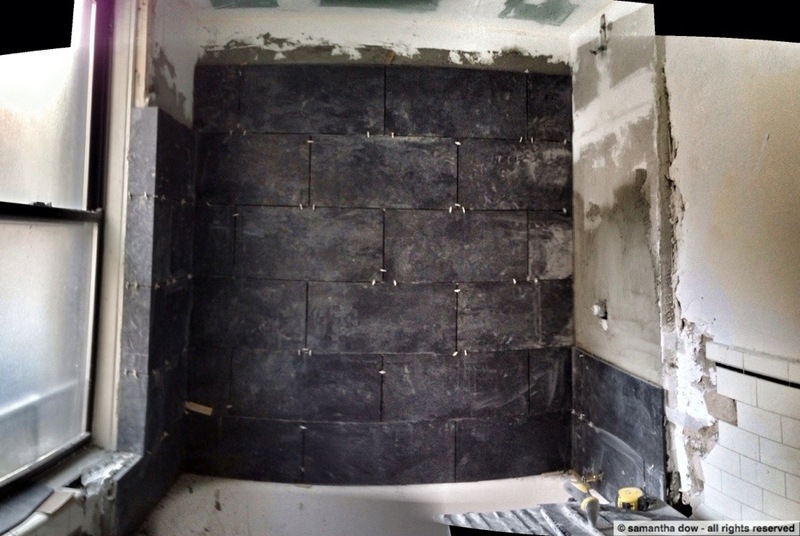 Getting around to posting progress photos from the past three days, by the end of Friday, they had started grouting the shower surround. They still need to put in the floor, but that should hopefully be Monday. Slow going, but it’s going. Plus, they got rid of most of the debris on Friday, so the rest of my apartment is now only a moderate disaster zone. 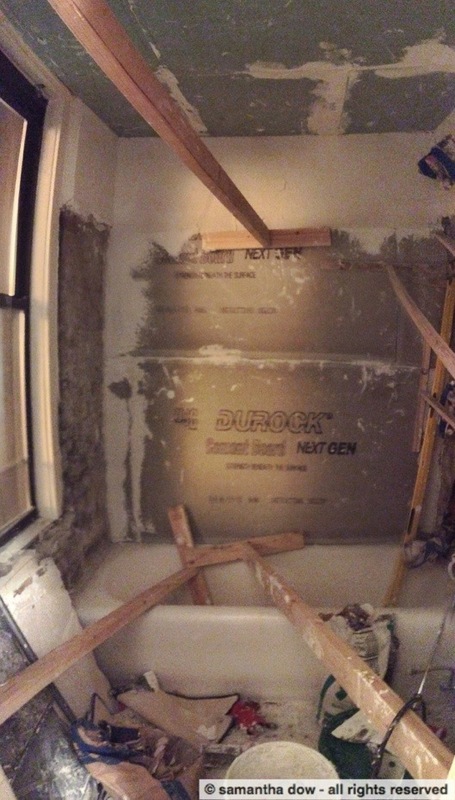 Not a great photo from last night, between the fact that it was about midnight and this is stitched together, but they’ve started installing the tile. At the rate we’re moving, this should be done in about 6 months, but now that my parents (and in particular my dad, who arranged for this whole project in the first place) are home, I have reinforcements in pressuring the guys to get everything done. I will be so happy when this is over. Tile finally arrived today, almost a full week after it was supposed to show up. Yet another delivery window of 10-2 which resulted in the delivery actually arriving after 3pm. So pretty much an entire lost day as far as productive work in the apartment, but now we get to start moving forward again, and I’ve dug out the air mattress at my folks as they return tomorrow, so I lose the bed. More than the delay, I have to say I’m most offended by the runaround, revisionist history and outright lying that the store engaged in. Today, they refused to refund even a portion of the exorbitant delivery fee that was originally charged because they claim the delay was completely reasonable and apparently entirely the fault of my contractor for not communicating with them enough. Nevermind that I, personally, was on the phone with them multiple times every day getting a different story each time, including last Thursday, when they placed all the blame on the manufacturer for shipping it wrong. Their truncated chronology jumps from Tuesday, when the tile was supposed to arrive (even though no one contacted myself or my contractor to schedule), directly to Good Friday, when my contractor refused to wait for a significantly delayed after-work-hours delivery. And that refusal apparently absolves the supplier of all responsibility for the delivery failures on Tuesday, Wednesday, Thursday, and the actual scheduled delivery window on Friday. Hopefully this is the *thing* that goes wrong with the project, as at least one snafu is inevitable and this one doesn’t involve anything leaking or exploding. No actual updates on the construction front, since it’s the weekend and my building doesn’t allow work, but I still had to stop by and check on Sadie who is locked in cat jail. Otherwise known as my kitchen. She’s doing fine, and is usually fast asleep when I come in, but would clearly rather be out amongst all of the construction debris. I have visions of her thinking it would be fun to jump into a half-empty bucket of joint compound. 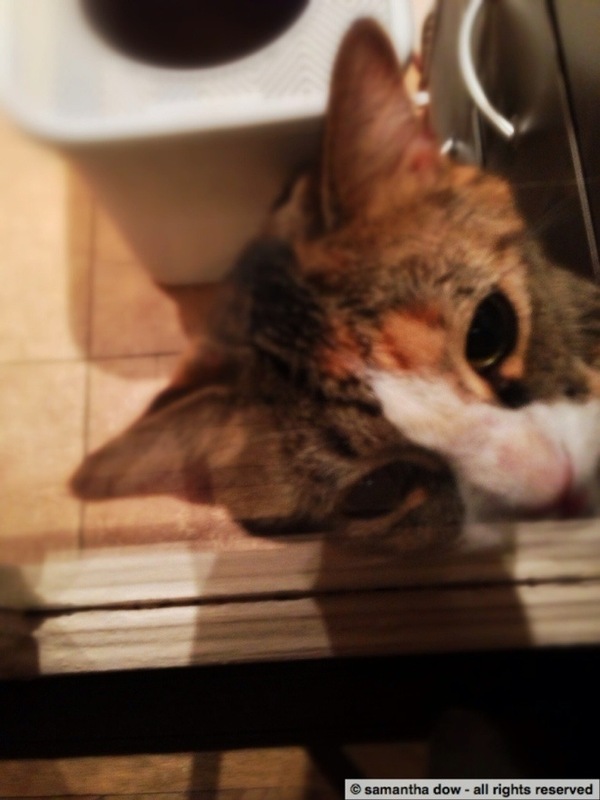 So in the kitchen she stays. The photo is a little warped looking, as its stitched together from a few photos, so it get a little fisheyed. The tile still hasn’t shown up. More excuses today. After giving us a delivery time of 10am, which turned into a delivery “window” of 10-2, my contractor got a call after 2pm saying they were “several hours” away. Given that workers have to be out of the building no later than 5, that was clearly not going to work. So monday is the new promised day. This is now affecting our ability to get the rest of the bathroom done, as the new paneling and cabinets for the non-tiled areas (which is largely going to go over the remaining tile rather than ripping it out), pretty much requires the floor to be done. 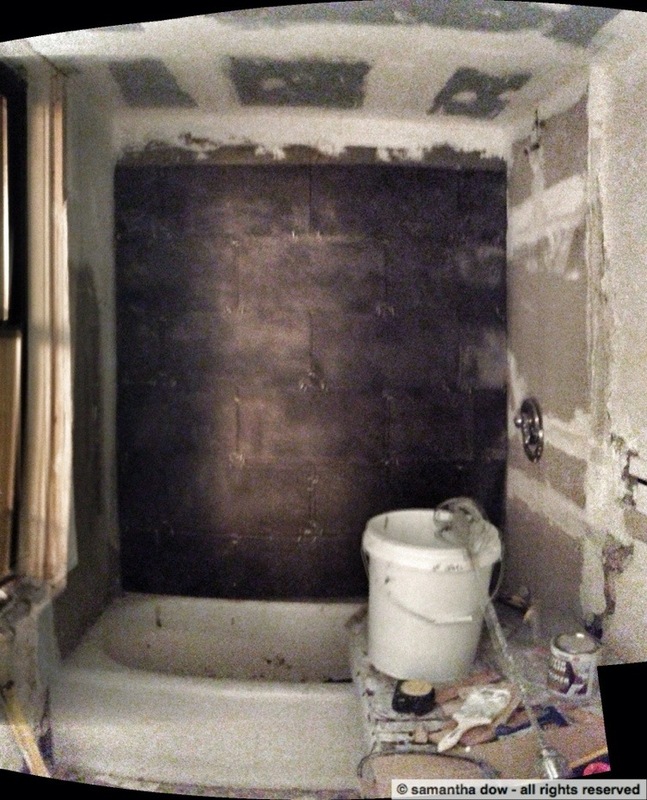 Not to mention reinstalling the toilet and sink. And, well, the shower. 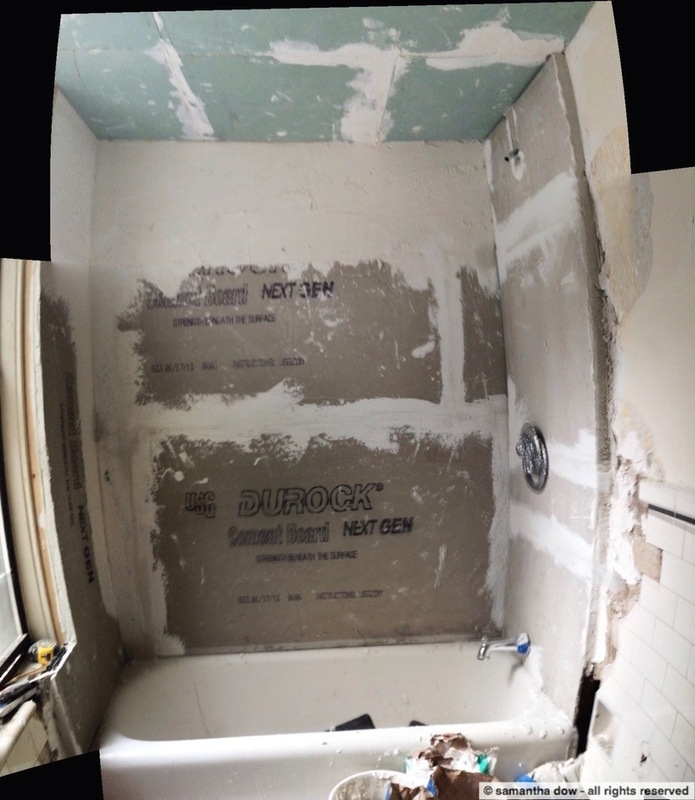 The shower is a bit more boxed in than it was before, largely due to the fact that the old tile was pretty much attached to the building’s masonry rather than drywall. Contractor thought it might be a good idea to put a layer of cement board between my tile and, well, the exterior wall of the building. 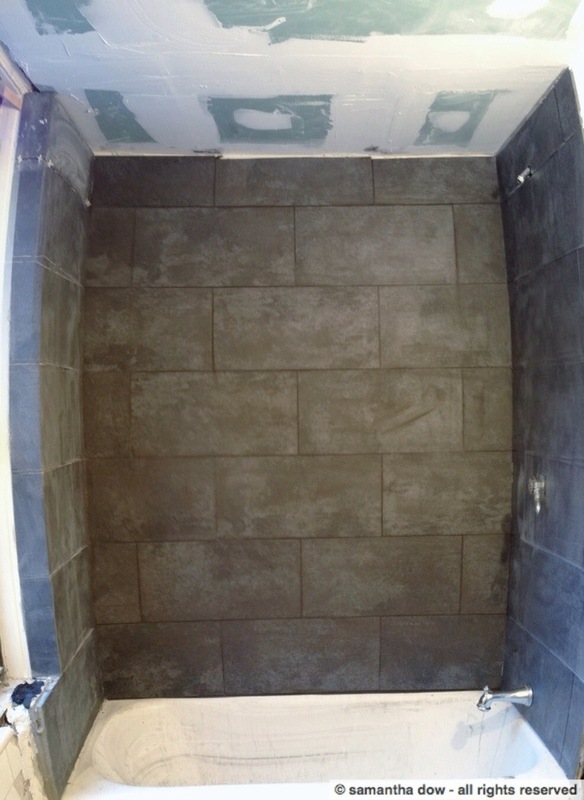 As I learned from Wikipedia, cement board is, by far, the best substrate to use as tile backing as it is more water-resistant than other options. But they’ve got the sample tile (the only tile I have!) in there to confirm that it will all fit, depth-wise, so I think we’re good. Plus, a bonus photo of Sadie greedily gobbling down dinner. 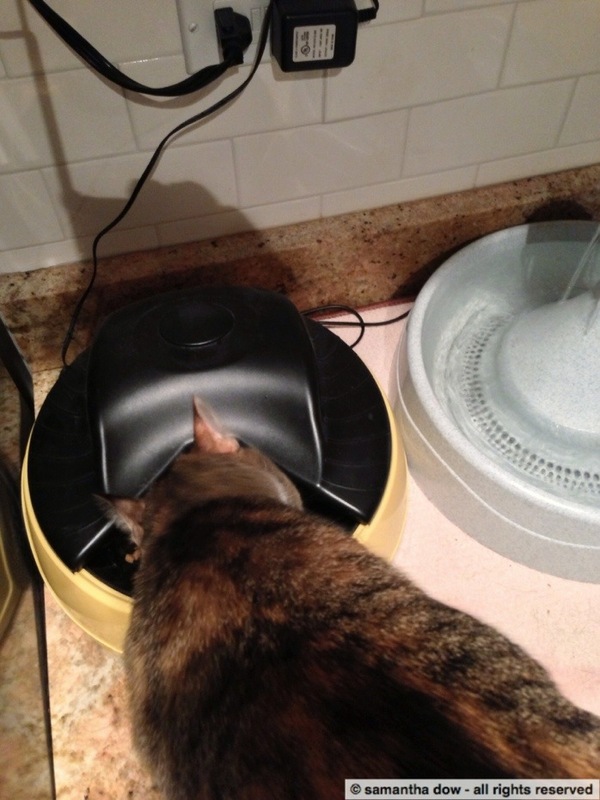 She’s not loving the situation, but she has not lost her appetite! Today they definitely made more progress, finishing off the ceiling drywall and getting the underpinnings for the shower in place (at least along the back wall). The biggest issue today revolved around something that wasn’t the contractor’s fault. The tile that I ordered hadn’t shown up yet, even though it should have definitely been there by now. My contractor spent time yesterday trying to find out what was going on, and couldn’t get a straight answer out of the supply store I had ordered it from, so I called my original sales guy who was all “it should have been there Tuesday”. Once he figured out that the delivery folks had never contacted me or my contractor, he got on the case (to his credit). During the couple of hours that we didn’t know what was going on though, I had a mild freakout that for some reason, the delivery people had absconded with my tile and this would never get done. My parents bore the brunt of that freakout via email, if only so that I didn’t have a meltdown at work. In any event, they claim the tile will be there tomorrow. I knew I was probably being too optimistic in thinking this would be done by mid-next week, but I’ve clearly been set straight on that front. As I said to my super when I stopped by this evening, it’s a good thing that I overestimated and said all the work would take a month in my application to the board for approval! As an added bonus, I get to sleep in tomorrow. I will have to go in for a few hours in the afternoon despite the holiday, but given that I was fully expecting to have to work the entire day, I feel like I’m getting a time dividend. Pretty sure my parents won’t actually kick me out if absolutely necessary to stay longer, but, well, you never know. The contractors appear to have finished ripping out most of what they were going to rip out, and the drywall arrived today, so i think this is progress. Not sure they’re going to be done quite on schedule, but it should be hopefully far enough along to be able to move back in by mid-next week while they finish up details (provided the new tile and such actually arrives tomorrow). In other goings-on, today was a complete clusterf*ck, transportation-wise. This morning I got on the 1 train only to realize I was sitting across from some guy jerking off. I was tempted to post his picture on hollaback, but I didn’t have the energy, so I just moved. Not an auspicious start to the day though. Then, on the way home, AFTER the doors shut on the shuttle, the conductor announces that there is no uptown service on the 1, 2, or 3 trains at all, due to a “sick passenger”. If I had known BEFORE I got on the crosstown subway shuttle, I could have just gone back upstairs and hopped on the bus, but no. We were trapped. Which meant I had to trek almost a mile underground in the most ridiculous transfer that exists from the shuttle to the C train in Times Square. which is awful, and now I’m clearly the worst person in the world too. Since I’m already going to hell, I responded that maybe it wouldn’t be so horrific if they had done something to address this issue the last 1000 times that it’s happened. For some reason, they didn’t respond to that one.